The vibrant, colorful world of Oriental art is on display at the Freer Gallery of Art and the Arthur M. Sackler Gallery, which together form the Smithsonian Institution’s National Museum of Asian Art. Connected by an underground passageway adorned with priceless works, they house one of the world’s greatest collections of Asian, Islamic and Near Eastern art along with significant ancient Egyptian and American artistic pieces. With artwork dating from the Neolithic period to modern times, the institutions are among the most-visited art museums in the world. The Freer Gallery traces its origin to the collection of railroad car-manufacturing magnate Charles Land Freer. The self-taught art connoisseur owned the largest collection of works by famed American artist James McNeil Whistler. In addition to helping Freer amass his stunning collection, Whistler convinced the industrialist that the collected works should be displayed in a major city. Freer was persuaded by his friend Charles Moore to display the collection of Oriental, Egyptian and Near Eastern fine arts in Washington. The industrialist proposed donating his collection as well as the funds required to build a suitable museum. Because of delays during World War I, the construction of the Florentine Renaissance structure featuring pink Milford granite that began in 1916 was not completed until 1923 when it opened to the public. Architect Charles Platt took inspiration from Freer’s visits to palazzos in Italy. The interior has Tennessee marble floors and Indiana limestone walls. Freer’s will stipulated that his namesake museum only display objects from his collection. In order to expand the Smithsonian’s Asian art holdings, a second museum would be required. After visiting the Freer Gallery in 1979, Prime Minister Masayoshi Ohira pledged $1 million from the Japanese government to help the United States build an annex to the original museum. The Arthur M. Sackler Gallery opened to the public in 1987 based on the 1,000-piece collection of Asian works donated by its namesake benefactor. Sackler also contributed $4 million to support the construction of the facility. Ninety-five percent of the building is situated underground beneath the Enid Haupt Garden. Jean Paul Carllhian designed the Gallery, which is found in the Quadrangle Complex situated behind the Smithsonian Castle. Boasting pink and gray granite, the overall design was inspired by the geometric forms of the nearby Smithsonian buildings and decorations found in Islamic art. Visitors can explore permanent and special exhibits featuring many remarkable and unique pieces. Dating from the 12th through the 19th centuries, the Buddhist art from South Asia includes the majestic stone image of south-facing Hindu god Shiva Dakshinamurti and the gilded bronze figure of Palden Lhamo, the patron deity of Tibet’s capital city. The fourth-century Shapur Plate is the centerpiece of a remarkable collection of Iranian gold and silver metalwork. The Freer Gallery is home to the famous Peacock Room, a masterpiece of interior decorative art by James McNeil Whistler. The collection also features Korean ceramics, Japanese lacquers, Indian sculptures and Islamic paintings. Upon entering the Sackler Gallery, you will be welcomed by the Perspective series that features rotating works by acclaimed contemporary Asian artists from around the world. The Xu Bing sculpture entitled Monkeys Grasp for the Moon is suspended from the ceiling and adorns the staircase down to the reflecting pool. Works from several centuries are on display in the Sculpture of South Asia and the Himalayas Exhibit. Other highlights of the Sackler Gallery include Chinese jades, Japanese ceramics and Islamic manuscripts. The galleries are located on the south side of the National Mall. They are open from 10 a.m. until 5:30 p.m. every day except Christmas. The wheelchair- and stroller-accessible museums offer free public tours. The nearest place to eat is located inside the Smithsonian Castle. Visitors may photograph the items in the permanent collection for non-commercial purposes. Large bags or backpacks could delay your entrance because they may be subject to a lengthy search. The museums also regularly host artist talks, concerts, films and other events. On-street parking near the museums is very limited. 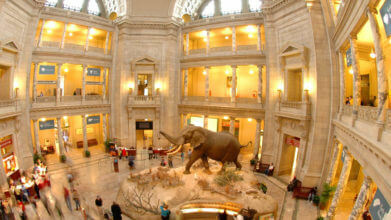 The galleries are within walking distance of the Smithsonian stop on the Metro Orange and Blue lines. The most convenient way to reach the museums is the Old Town Trolley. Pick up the trolley at one of 25 stops to hear a fascinating and entertaining story about many of the most popular monuments, memorials and museums in the nation’s capital. Hop off the trolley at the Freer and Sackler Galleries to explore the exhibits at your own pace. To continue this informative sightseeing tour of Washington, D.C., climb aboard one of the trolleys that pass by the stop approximately every 30 minutes. You do not have to worry about navigating congested city traffic or finding a place to park when you ride the convenient Old Town Trolley. Completed in 1855, the Smithsonian Institution building initially housed the facility’s entire collection of art, artifacts and other historic items. Designed by James Renwick, Jr., the red sandstone building is colloquially known as the Castle for its faux Norman architecture. The Castle still houses several unique exhibits highlighting the institution’s ever-expanding collection of objects. The beautifully landscaped 4.2-acre Enid Haupt Garden is located adjacent to the building. The National Museum of African Art displays a wide selection of traditional and contemporary art from the entire African continent. Highlights of the more than 9,000-piece collection include sculptures, masks, textiles and photographs. Established in 1964, the museum was the country’s first institution dedicated to African art. The National Air and Space Museum features interactive exhibits, planetarium shows and IMAX films as well as a wide collection of objects chronicling the history of flight and space travel. Unique items on display include the original Wright Flyer, the Spirit of St. Louis and an actual lunar rock. Honoring the nation’s first president, the 555-foot Washington Monument is the tallest obelisk and stone structure in the world. The memorial is capped by a 9-inch-tall aluminum pyramid. This iconic symbol of the nation’s capital provides panoramic views of the city from the observation deck that is accessible by an elevator and an 897-step staircase.